X5SW Drone – Works Great! AN/FPQ-14 Pulsed Microwave Fish Zapper – Works Great! PATRICK AIR FORCE BASE, Fla. — Thousands of dead herring provided an odious distraction Monday from otherwise hospitable beach conditions, dotting the shoreline from south of Patrick Air Force Base through Melbourne Beach. They appear to be the same species of fish — thread herring — found washed up along other beaches along the Space Coast last week. Countless thread herring washed up dead Thursday along beaches in Cape Canaveraland Cocoa Beach. “There was nothing out here yesterday,” said Ron Van Kempen, a seasonal resident from Minnesota, fishing just south of Patrick AFB Monday. He cast his fishing line among floating herring corpses, which also speckled the beach where he stood. 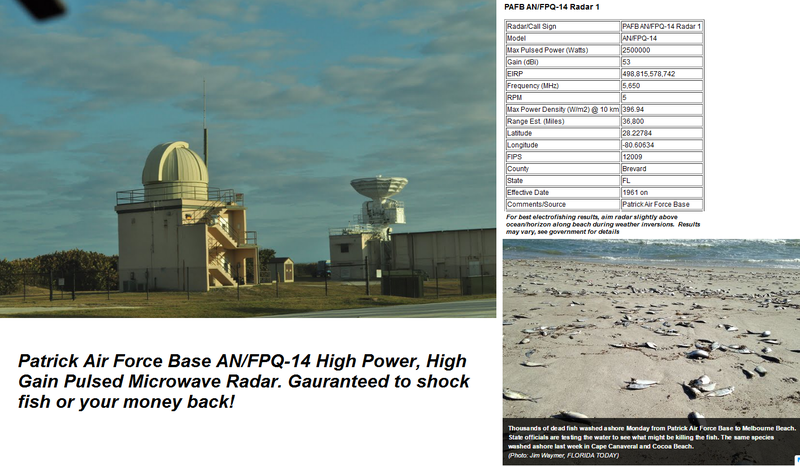 Using FAA Guidelines, the safe distance from this radar is over 1500 feet and the dumbasses put it right on the beach near conductive seawater!